Serious games are steadily becoming a powerful tool for educational purposes as their challenging characteristics are suggested to make them particularly appealing to learn with. This challenging nature, however, comes at a price, namely, the need to maintain the optimal balance according to players’ emotional experiences. 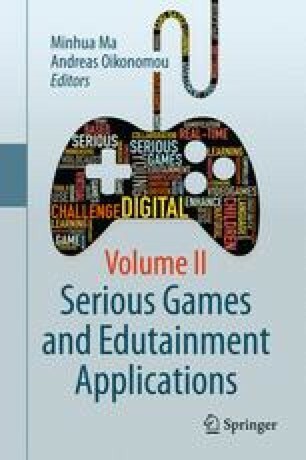 By focusing on players’ emotions as main player characteristic considered to be important for learning processes and performance, this chapter surveys empirical research and current game development that contributes to an emotion-adaptive framework for games. The goal of this chapter is to clarify the importance of continuously adjusting game characteristics to players’ emotional states. As the interaction between game characteristics and players’ emotions highlights the need for continuously assessing at what point gameplay becomes more or less positively or negatively affected, methods for emotion recognition are presented. A summary of adaptable game design elements as well as implementation methods for adaptivity are provided. This work was conducted as part of the project “Serious Games—Skill Advancement Through Adaptive Systems”, funded by the Carl Zeiss Foundation, as well as “EffIS—Efficient and Interactive Studying” (FKZ: 160H21032), funded by the German Federal Ministry of Education and Research (BMBF).